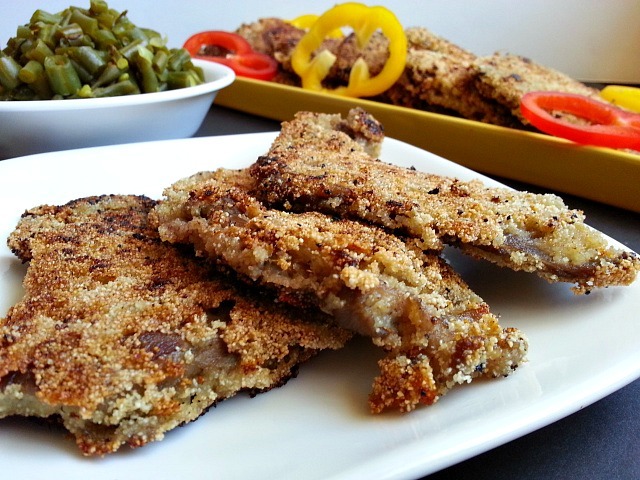 The Goan Beef Cutlet Recipe is a spiced version of a German Schnitzel and Chicken Fried Steak and the coating is cream of wheat/ semolina/rava. I love these cutlets. We used to make sandwiches with the leftovers as a quick snack. Beef, fish and pork is consumed a lot in a christian household in Goa. Every time I think of a new recipe for my blog it always has to do something with beef 🙂 . 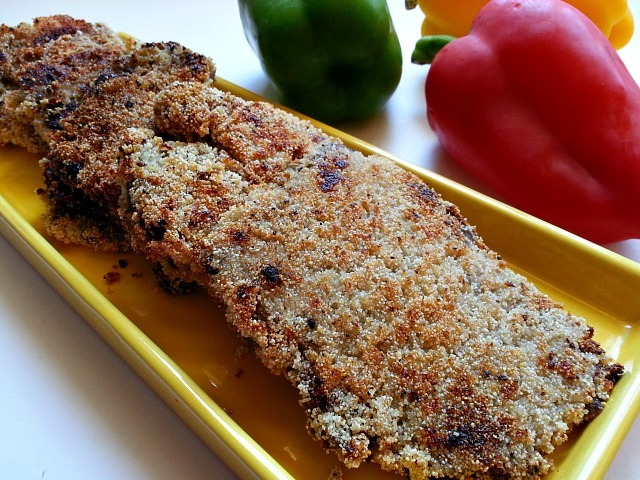 If you do go online and search for Goan Beef Cutlets you will find a lot of recipes with ground beef. A pattie made with ground beef is called as Almôndegas for a Goan cutlet only sliced beef that is tenderized is used. I used Chuck Steak to make this recipe but I wouldn’t recommend as it was way too chewy. Sharing my families recipe with you. Wash and wipe dry the meat. Grind garlic, ginger, jalapeno, cloves, peppercorns and vinegar to a fine paste. 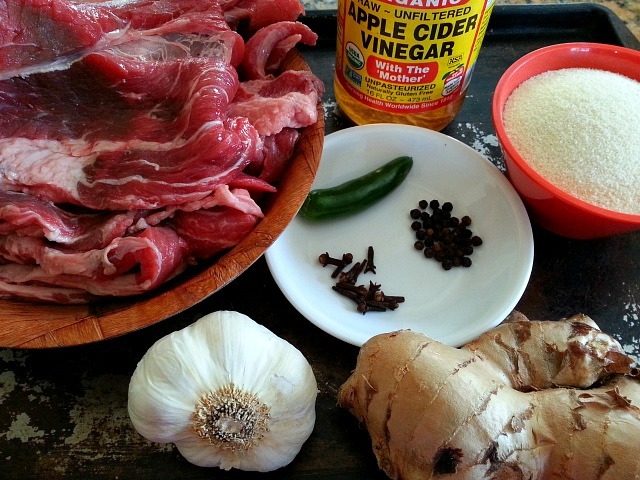 Apply salt and the ground marinade to the cut meat. Let marinate for 1 to 2 hours in the refrigerator. Heat oil in a shallow pan. Coat each slice with cream of wheat and shallow fry till light golden brown. 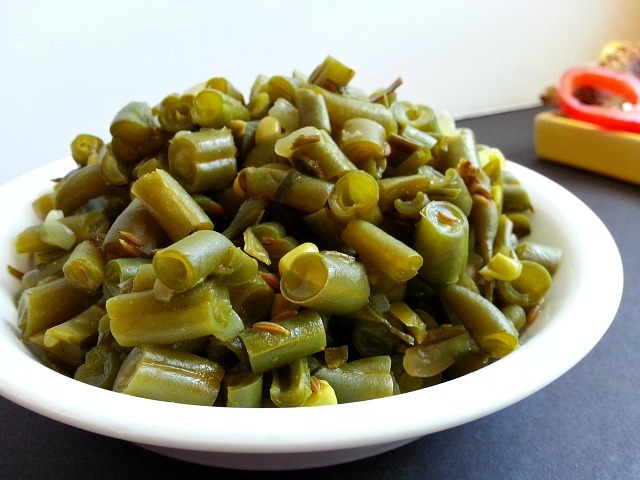 Serve as a side or enjoy with Oil-Free Sautéed Green Beans like I did. In a pot add all the above ingredients together. Mix well, cover and cook for 25-30 minutes till the beans are soft. Check and stir in between. If adding grated coconut add in the last 5 minutes. Mix well and enjoy as a nice tasty healthy side. Good evening Nandini. It’s a pleasure to read your recipes. I’m not much of a beef eater but I love green beans so I will surely try this recipe. Iwant to thank youn for checking my site and hope you come back. I’ll be sharing my Texas chili recipe in just a few days. Are you in India? I’m in Indiana, USA. Hi Jack, thank you for stopping by. I will look forward to your recipe. I live in Los Angeles though I was born and brought up in India. What a beautiful meal. It sounds delicious. Hugs. I can do this gluten free, no problem, by using corn flour or corn meal (or a mix of both), or ground pecans as the coating. Thanks, this looks amazing! Thanks for finding my blog post with desert flowers. Admire your images. The color is excellent. You are so welcomed 🙂 . And Thank You to you as well. Mouthwatering recipe…very easy and simple one too….Thanks for liking my Focaccia Bread recipe!!! You are so welcome 🙂 . When you mentioned serving the beef cutlets on a sandwich I imagined it topped roasted peppers and onions. Yum! Thank You so much. That is very sweet and kind of you. I am humbled 🙂 . This looks delicious, I might try this tomorrow. One day, soon, when I have a proper kitchen I am going to work my way through all your recipes. Taking me a while to find cream of semolina, I guess I’ll have to head in to a big supermarket. But I have everything else. I’ll let you know how it goes. Thanks for visiting my blog. I rarely eat meat but if this dish dish was up to me I would savour it. All your recopies are a delight I only visit you now and again and cruse around to get a few good tips especially with herbs and spices. You are so welcome Jack. I am happy to know you find my blog useful. You have a great 4th! Thank you much Tanveer 🙂 . CFS is a family favorite, but the Goan spices and twists make a totally different dish! Thank You Paul. That is very kind of you to say. Yum! It looks and sounds delicious. Hugs. Thank you Ron for the complement, which I will gladly take 🙂 . My husband says the same. It’s just too much work. I know wordpress is acting up. My reader too does not show me a lot of the blogs I follow and I feel bad I cannot support my friends. We need to tell them to stop being like FB and select our news feed for us. I like the idea of making sandwiches with the leftovers. I would love that. You can say carne de vaca o vacuno for beef. So you would get on fine. I have learnt about the different cuts over the years with the help of my local butchers: still quite a few around- hope they survive the supermarkets. Sometimes I would describe the recipe & they would suggest what would work. That’s a problem with beef: the tenderest cuts get spoilt from coating & frying & others maybe too tough. I will try this out with certain cuts of beef, which are good for “empanar” (breading)- recipe sounds really tasty. In US the cuts are different, but more or less these Spanish cuts come from some of the part called “Round” or “Top/Bottom” sirloin. I have never tried coating with rava, sounds very crunchy & satisfying. It’s fascinating how the similar sounding words may mean a different dish :). “Albondigas” here means meatballs, and a ground meat patty shaped into a cutlet is called a “Filete Ruso”= Russian fillet! Thanks Nandini. I hope you had a great weekend too. cream of wheat! love it. Great post, brought back some great memories, and inspiration for future recipes. I wish I could sit at your family’s get-together table. All of these recipes have me positively drooling at how flavorful and homespun they must taste. Thank you for sharing your recipes. If I ever get money to prepare good food like this, I will be coming to your page right away! Awww….. I am lost for words. But Thank you so much. You take care. FOR A BISCUIT’, I said this before and I have to say this again, Your recipes are OUT OF THIS WORLD and Your photos are PHENOMENAL. Thanks for sharing Your FABULOUS RECIPES and YOUR CULINARY TALENT with US. 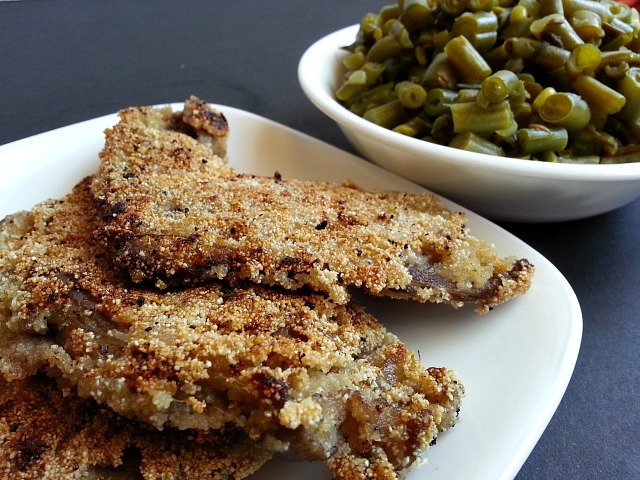 I am looking forward to some YUMMYLICIOUS BEEF CUTLETS at the weekend (courtesy NANDINII). Thank You much Mr Stan for your encouraging words. I am happy to know that it brings back Happy memories about your mum, Grand Ma and Donna Ida. I am sure there are variations to the recipe in each household. Since my dad would have stomach ulcers our food was much blander then most Goan cuisine. Love your quote Mr Stan…The English made the Biscuits after all 🙂 . You and Mrs Stan have a great weekend as well. Super recipe ,l liked the spices a lot. We will tried it with chicken too. Greetings. Thank you so much Jalal. That will be awesome. Please let me know if you do use chicken and how it turns out for you :-). My wife used thin chicken breasts ,same spices,and she used olive oil to fry the chicken.,(( She call it Chicken cream chop)tender and delicious. Regards. Sounds very yummy Jalal. Can I come over :-). Do convey my appreciation and Thanks to your wife for sharing her lovely Chicken Cream Chops Recipe. My Wife ,Hilda says Hi to you and happy to read more of your new recipes. Thank You Much, Timm. Wishing you too a great weekend. Let me know how it goes.